Pedraforca has a very peculiar shape, composed of two parallel ridges (the pollegons) joined by a neck (the Enforcadura). The upper ridge has an altitude of 2,506.1 meters with a secondary peak, the Calderer of 2,475.4 meters and the ridge below is 2444.8 m tall. The Enforcadura or forking section’s highest point lies at 2356.2 m.
Pedraforca is one of the most beautiful mountains in Catalonia. It has two main peaks that look like a pitchfork when viewed from the East (Pedraforca means ‘pitchfork of stone’ in Catalan). The North face is a steep rocky wall in which dificult climbing was introduced in Catalonia by Lluis Estasen in 1928. Nowadays a lot of people ascent it by the normal route, specially in summer, because it is easy. 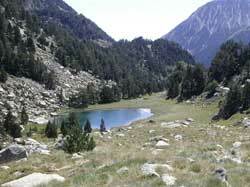 The route climbs the north peak (Pollegó Superior), which is the highest. It is a nice route, you cross a forest, walk up a col (Coll del Verdet), climb a little rocky section (very easy) and follow the ridge overhanging the north face (a little aerial).